Wednesday November 22nd 1922 I was at Venes till 3.30. Went with Laura to see new school house. Edna Price is to married today. Thursday November 23rd 1922 I went up town and called at Woolfs. Had lunch with Laura at restaurant. Spent afternoon with Lizzie Duncan. Friday November 24th 1922 I finished pillow cases for Baptist Bazaar at Centralia and sent to Mrs Burton. Went up town in PM. Went to a lecture with Edith in evening. Laura is in Champaign today. 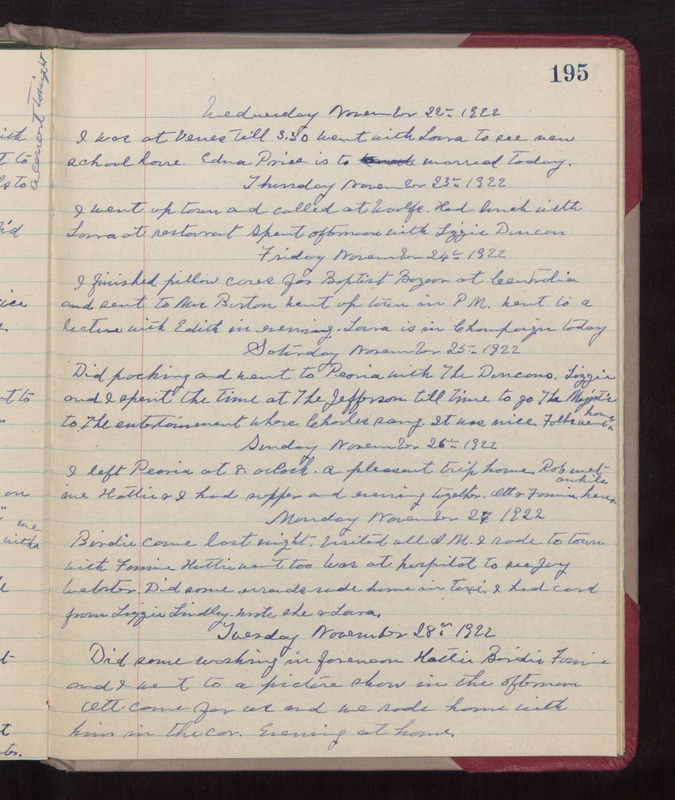 Saturday November 25th 1922 Did packing and went to Peoria with The Duncans. Lizzie and I spent the time at The Jefferson till time to go The Majestic to The entertainment where Charles sang. It was nice. Folks went home. Sunday November 26th 1922 I left Peoria at 8 oclock. A pleasant trip home. Rob met me. Hattie & I had supper and evening together. Ott & Fannie here awhile. Monday November 27th 1922 Birdie came last night. Visited all AM. I rode to town with Fannie. Hattie went too. Was at hospital to see Ivy Webster. Did some errands rode home in taxi. I had card from Lizzie Lindley. wrote she & Laura. Tuesday November 28th 1922 Did some washing in forenoon. Hattie, Birdie, Fannie and I went to a picture show in the afternoon. Ott came for us and we rode home with him in the car. Evening at home.